Homeowner maintenance: Many things that can be done by the homeowner are low cost or free. All installations come with a small granny groomer that is for the owner to use. It takes a few minutes depending on the size of the area and is an easy task that can give your yard a fresh look in minutes. This can be done as often as needed. Also, having us perform an annual Spruce Up! can help with those spots that are stubborn or heavy traffic zones stay standing up for longer. Fall is a good time to address leaves and other tree-shedding debris that decorate your lawn, and show up with or without an invitation. 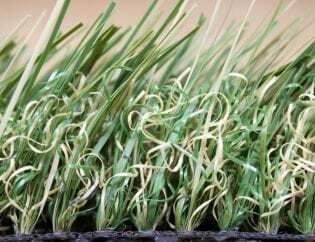 Now, you are not dealing with a natural lawn so they will not “kill” the grass, nor will they biodegrade as quickly. But they will mat down the turf, so on a dry day, get that leaf blower out and get the leaves off the turf. Same with the apples from the apple tree, the needles from the pine tree, etc. Clean ‘er up! 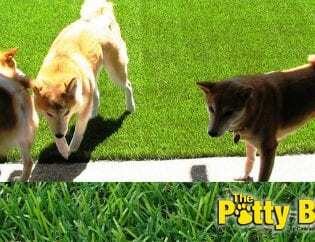 If you have pets that urinate or poop on the turf, there is no worry about harming the turf. But there IS maintenance. Imaging if you never flushed the toilet? Pew! 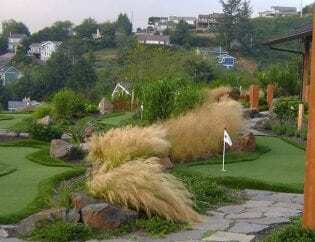 We suggest scooping up the solids and rinsing the turf on a regular basis. The dryer months are more prone to urine odors if not watered regularly. 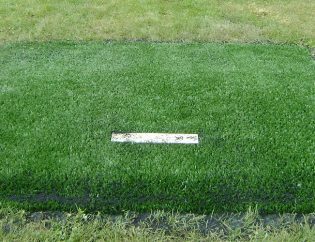 In the case where an odor does arise, we distribute an odor eliminator product that is safe and easy to apply to your grass. We are happy to deliver the product and give a short instruction on how the product works Additional maintenance and product information is available upon request. The easiest way to tackle this issue is to prevent snow from ever hitting your turf! If you figure out how to do that, please let us know! Snow and ice are a little hazardous for those of you who are playing or running on the turf, but of course what icy surface isn’t? The nice part is, it stays green and never turns to mud and you don’t have to reseed in the spring. But when the snow outlasts its welcome, it may have a tendency to matt it down and that can be addressed in the spring. For now, don’t use snow removal machines that can be used on grass because it may tear up the fill in the turf. Use a snow blower. This is probably the most effective way to get snow off of your turf in a hurry, if it dry snow. Shovel. But be careful! Don’t dig into the snow, simply attempt to scrape it off the surface without damaging the fill. Wait it out. If it’s a moderately light snowfall and it’s sunny out, it might be best to wait it out. 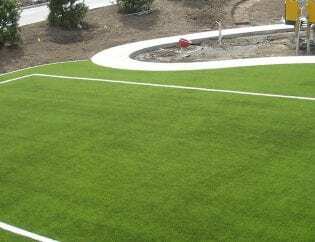 Once the snow melts, our turf will dry quickly, which means it’ll be perfect to play on! We highly recommended a professional Spruce Up! on a yearly basis, usually in the spring or fall. 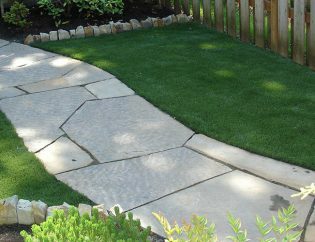 The heat and higher activity level in the summer can disrupt infill and matt down the blades on your lawn. As well as rain and cold weather can bring in a lot of debris and possibly disturb the infill. 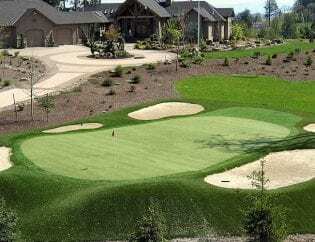 Our maintenance packages include power brooming, blowing off debris, check for loose seams, check infill levels, weed control, disinfecting turf and dog odor control. It will leave you with a fresh looking yard. Maintenance is a very good practice and can add many years to your product. Spruce Up! prices start at $96 and vary depending on size, location and maintenance needs. Professional services can be scheduled as needed, annually, or monthly. 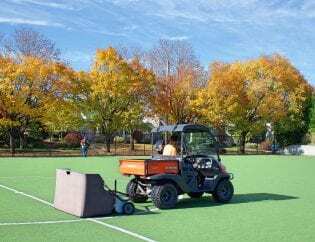 The best maintenance that an owner can do for their green is clearing debris. Keeping the green clean is an easy and critical task. Re-compacting the green can be done by the owner but we highly recommend our expert equipment and maintenance crew. Weather maintenance for a green and lawn are the same and can be found under the grass maintenance section. A professional Spruce Up! is highly recommended on a yearly basis, usually in the spring time. The rain and cold weather can bring in a lot of debris into the grass and possibly disturb the infill. 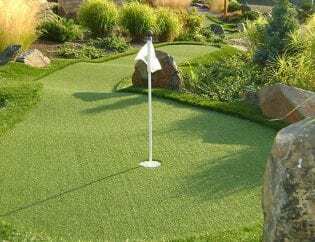 Our maintenance package for putting greens includes re-compacting the greens depending on the speed you are looking for, blowing off debris, check for loose seams, check infill levels, clean cups, weed control, moss control, disinfecting turf and dog odor control. Maintenance is a very good practice and can add many years to your product. Spruce Up! prices start at $144 and vary depending on size, location and maintenance needs. Professional services can be scheduled as needed, annually, or monthly. In the event any damage has occurred during normal use or accidentally, please call us to diagnose the problem, attempting to fix the problem yourself may cause permanent damage and may void the warranty, so please call first. All site visits and consultations are free.